New Features To Move Your Forward. Contact our Volkswagen dealership in Noblesville, IN, to learn how you can be one of the first to test-drive the brand-new 2019 Volkswagen Jetta. With state-of-the-art technologies, turbocharged and fuel-efficient powertrain options, exceptional warranty coverage and more, the 2019 Jetta is guaranteed to enhance your day-to-day commutes and family vacations alike. Schedule an appointment today to learn how you can test-drive the 2019 Volkswagen Jetta as soon as it arrives at our Indiana dealership. 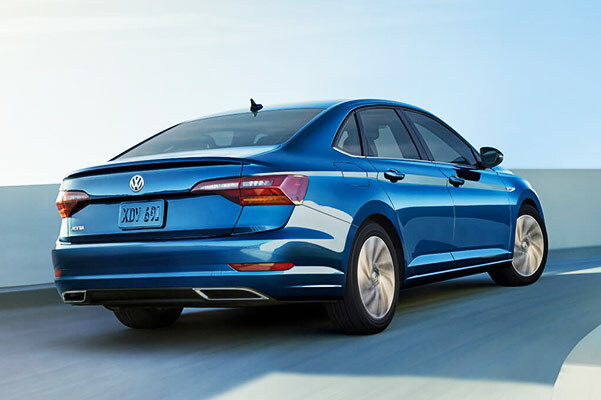 The 2019 Volkswagen Jetta offers a turbocharged engine that is also highly fuel efficient, returning up to 40 highway mpg and 30 city mpg so you can sail past the pump time and time again.1 If you're a fan of customized control over your vehicle, you can opt for available driver modes that let you switch between Eco, Normal, Sport and Custom modes with ease. Safety is also a major focus for VW engineers, and the Jetta will keep you protected with optional driver-assistive technologies like an Automatic Post-Collision Braking System, an Intelligent Crash Response System, Lane Departure Alert (Lane Assist), High Beam Control (Light Assist) and so much more! As you cruise with confidence and peace of mind, you'll love how the new Jetta provides a host of comfort and convenience amenities, such as two-tone V-Tex leatherette seats and available 10-color customizable interior ambient lighting. When you upgrade to available ventilated leather seating and optional heated front seats, you can always stay cozy inside the new Jetta sedan. If you need help with directions, an available 8-inch touchscreen navigation system will assist you, or you can upgrade to the 10-inch high-resolution Volkswagen Digital Cockpit display and access VW App-Connect®, Apple CarPlay™ and Android Auto ™. Your drives will never feel as unique as they do in a new Jetta! Additionally, with the unmatched Volkswagen People First Warranty you'll enjoy a 6-year/72,000-mile Transferrable Bumper-to-Bumper Limited Warranty that always has you covered.2 Learn more about the 2019 Volkswagen Jetta by contacting Tom Wood Volkswagen Noblesville and scheduling an appointment to visit us once this new VW sedan arrives.